Enjoy Setouchi’s calm water and amazing granite shoreline from a SUP (Stand-up Paddleboard), now a worldly popular water activity. It’s a short ‘walk’ on the water! We use stable and easy-handling SUPs even for first timers. We require a minimum of 2 people for the tour. If you are a small group (2-4 people), ask us about free pick-up from JR Takuma station, the closest railway station, as well as trip booking. Check in and meet your guide. 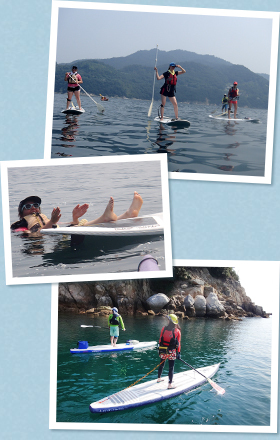 Paddle along the Setouchi’s unique shoreline. Arrive back to the base. Please note: This itinerary is an outline only. Your guide may decide to vary this program based on their judgement of weather, sea conditions, client ability and their fitness level. Select the day you like from the calendar with icons of “○” or “△”. Online bookings close at 18:00 of 2 days before the tour. Thereafter please contact us by using phone (+81-80-3924-9610). For credit card settlement through this website, please note that you need to complete your booking until 3 days before the tour. We accept cash only at our tour base. All trips are subject to having sufficient numbers and suitable weather conditions. Please refer to terms and conditions before you make a reservation.